It feels like I did little more than blink and somehow summer came, went, and we’re back to the sort of days that are just meant for soup. Cloudy and drizzly outside always translates to chopping and stirring inside. It’s time to get back into my kitchen and back into my soup game. 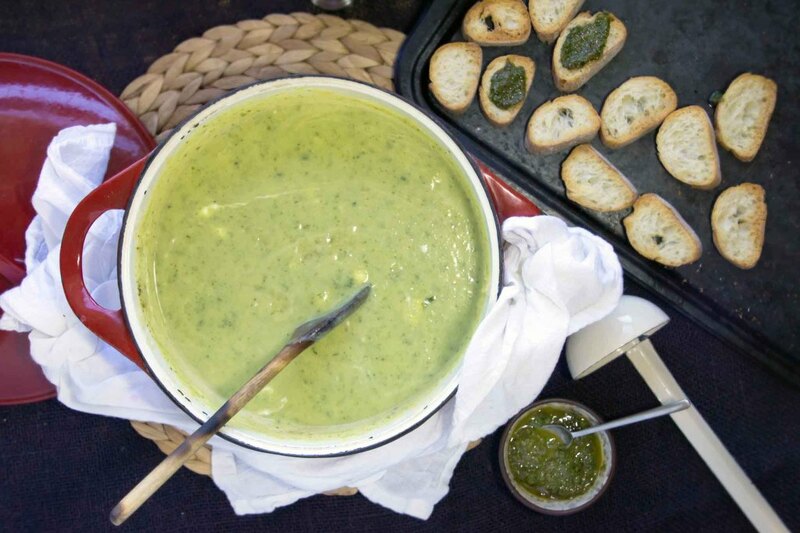 This is a really simple zucchini soup that’s swirled with creamy goat cheese. Crunchy baguette croutons, smeared with fresh basil and mint oil, garnish the soup and distinguish one bite from the next. 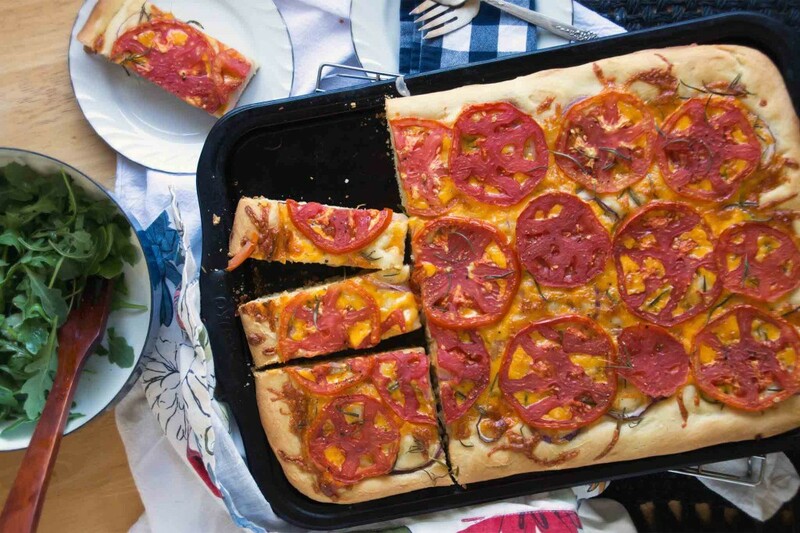 It’s a celebration of late summer produce, with a good dose of fall comfort. When I’m driving home from work at the end of the night, I always find myself doing a mental inventory of my fridge. What little bits and pieces do I have on hand that can be thrown together? 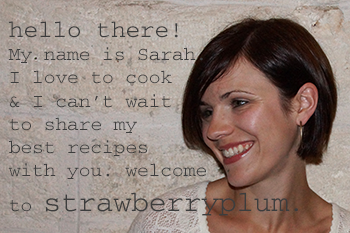 What can I come up with for dinner without buying any new ingredients? This is what I was exhaustedly doing this past Saturday. It had been a late one so I wasn’t really thinking dinner or even a midnight snack. My head and belly were already on to Sunday brunch and, sadly, all I could picture in the refrigerator was a carton of questionably old yogurt, a couple of stale bread ends, and a few fuzzy strawberries. Ugh. Then panic really set in when I remembered I had scooped up the last of the coffee that morning. What good is a Sunday morning if you don’t get to linger over coffee with a decent breakfast? So that’s why I found myself at the 24-hour grocer at 1:30 am, wandering bleary-eyed through the aisles, concocting my Sunday morning breakfast plan. 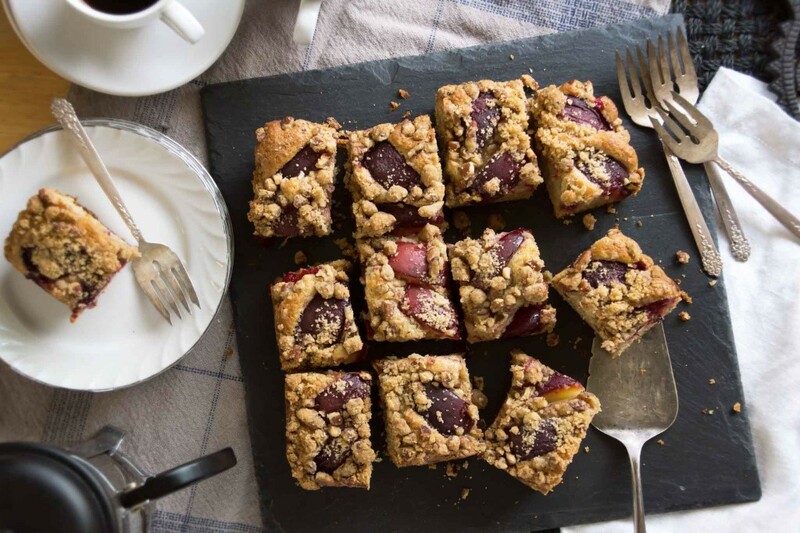 I picked up a bag of plums, sour cream, pecans, and coffee, then went home and slept hard, dreaming of the plum coffee cake I’d make in the morning. Thankfully, the coffee cake hit all the notes I was hoping it would and was totally worth subjecting myself to the other oddballs that do their grocery shopping in the middle of the night. The wedges of plum baked into the top are juicy and sing “summer’s not over yet” while the tender cinnamon-spiced cake warms you against the like-it-or-not fall briskness that has crept in to the mornings. And, of course, the pecan streusel. It’s the streusel that’ll having you reaching for your second (third?) piece. My third year of college, I spent fall semester in Florence, Italy. Immediately, I fell in love with the place–the different-from-home hum of the streets, trips to the market, gelato strolls, counter side cappuccinos, and, of course, the figs. Hang on, I think “fell in love with figs” might be the understatement of the decade. This was no fleeting love, this was deep, down, stupid, do-anything love. Fig season was in full swing when I arrived and if I hadn’t been similarly mesmerized by all the other foodstuffs that I was surrounded by, I could have lived off them. I took long walks, casing neighborhoods and hillsides that had fig branches hanging over gates and fences. I was not afraid to scale walls, I…should probably stop there. If I managed to get any of the figs back to my apartment, I mostly I just quartered them and ate them in their natural state or with a bit of honey and a wedge of cheese. If I had slowed down long enough, I like to imagine I would have baked something like this cake. 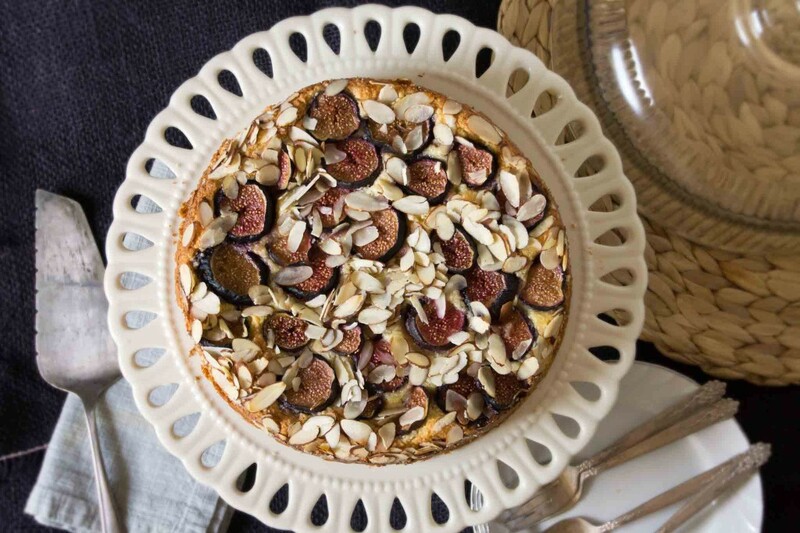 This is another distinctly Italian tasting cake–not too sweet, not too heavy, moist with ricotta cheese and loaded with almond flavor–topped with thick slices of juicy, ripe figs. It’s delicious as dessert with a spoonful of whipped cream and heavenly next to a cappuccino in the morning. I’m not entirely sure which is more abundant this time of year, zucchini or zucchini recipes. And with that said, this is my contribution to the year’s zucchini files. I’m standing tall and proud next to my contribution–this gratin is so delicious I’ll be tempted to devote next year’s garden entirely to zucchini! Thin rounds of zucchini are layered and baked with caramelized onions and creamy Fontina cheese. 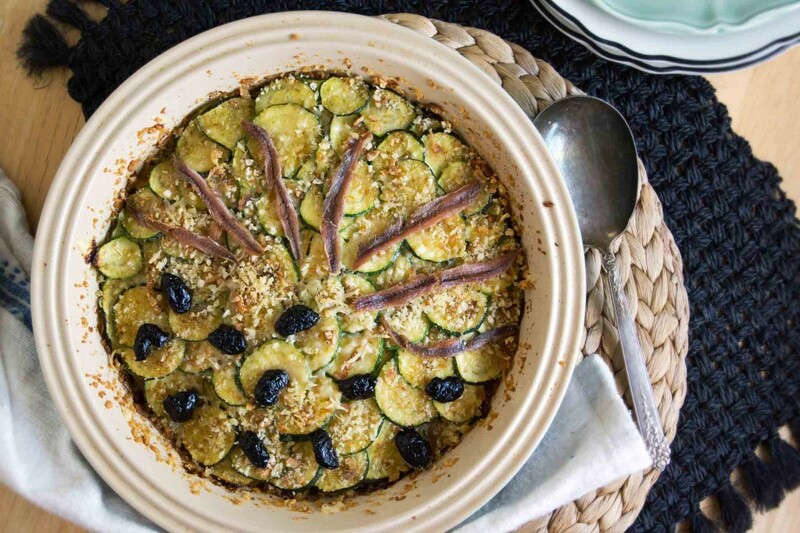 Breadcrumbs and Parmesan add a crispy, nutty layer of flavor to the top and bottom and a smattering of olives and/or anchovies adds a salty briny-ness that counters the sweet onions.